Must remind everyone that so far hasn't seen this clip yet: I love the colorized interior shots from aboard the Titanic. Some of her lounges are absolutely amazing: Cafe Parisien particularly. Another thing that also strikes me is how special it must have been seeing the Olympic enter New York in the years after the disaster: it would be like seeing the Titanic arrive, if you only imagined. The letters in the name on the bow of Olympic, looks very different from those of the name of Titanic on her bow. Is this a fact, that they used different kind of letters? I'm almost counting the days til the 3D-release. I will be living in the theatre probably. I wish I had the number of how many times I have seen this movie. It's just a masterpiece by James Cameron. Jan-Olav, I get the feeling that you are pretty interested in Titanic? I assume you have the "Ghosts of the Abyss"-DVD? One of the youtube-clips in this thread is from this movie (also made by James Cameron), but the movie hasnt been creditet on that clip it seems. I have collected Titanic-items for several years, and came across a gold-piece in a library in London in 2009. A huge book with copies of blueprints, tickets, telegrams, letters from survivors etc. Everything. Just everything!! It was the last book they had and I'm just hideously happy I got it!! I have a ton of books about the Titanic: some of them are really valuable to me and my collection. I do have the "Ghosts of the Abyss" DVD (off course I do... ). The first time I saw "Ghosts of the Abyss", it was in Bangkok on a 3D cinema. It gave me as many goosebumps as I have never ever experienced before. Can't wait for the 3D version next year... I'll be there, on the red carpet! Now you can win a dive to the wreck, if you create creative videos about "TV-joy". A contest arranged by National Geographic, norwegian RiksTV and the newspaper Dagbladet will give a lucky winner a dive to the Titanic next year. I already envy that winner. What an experience. Last edited by carinahansen; October 21st, 2011, 03:11. Well, I certainly wouldn't enter just so Jan-Olav would have a better chance!!!! Is there any way we can build a support staff for him??? I'm onboard Team Storli haha! I saw this one too.... this is probably the ABSOLUTELY biggest dream in my whole life. If I had to pay with my life immediately after coming back to the surface, it would be absolutely ALL RIGHT. That is how much I'd like to do this, but with my luck, there is no chance in h3ll that'll ever happen. Just read that a 269 meters long model of the "Titanic" is being built on dry land in an amusementpark in the south-east of Spain. A good nr. 2 if you miss the dive, J-O...? 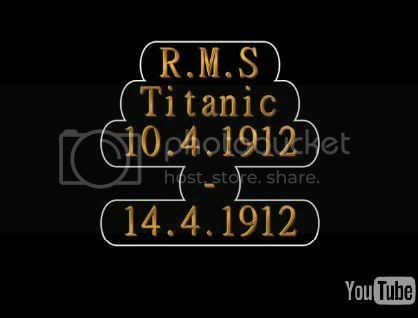 An amazing video to watch, and i agree those colourised interior shots of the Titanic were fantastic. She was like a floating palace. But this really jumped out at me and really brought it home to me. And until now i did not realise how short the Britannics life was - 23/12/1915 - 21/11/1916. Under a year. The builders must have been totally shocked to have lost another one of the sisters after such a short life. Image linked directly from article.